Mercedes-Benz vehicles ARE NOT fitted with Takata airbags containing "Alpha inflators". While the Government compulsory recall does not apply to NZ New Mercedes-Benz, we will be issuing a recall that applies to various NZ New Mercedes-Benz passenger car models produced between 2005 and 2017 and NZ New Mercedes-Benz van models produced between 2006 and 2017 that are equipped with non-desiccated frontal PSAN (Phase Stabilized Ammonium Nitrate) inflators. The affected airbags will be replaced in stages, as the replacement airbags are currently in production. This will ensure an orderly and responsible use of parts availability. We now have a Recall Initiation Schedule for NZ New Passenger Cars and Vans. This will be regularly updated as replacement parts become available. The schedule is attached below. Detailed instructions will be communicated with registered owners of the affected vehicles as each stage is released. The VIN lookup available on this website, is for customers with a NZ New Mercedes-Benz to check if their vehicle is affected. We will keep our website updated and will distribute additional information when available. Which vehicle models and year range are affected? How do I locate the VIN on my vehicle? Open the front right-hand (drivers) door. You will see the vehicle identification plate ①. The Vehicle Identification Number (VIN) will be 17 character and starts with WD. The Vehicle Identification Number (VIN) can be located on your latest vehicle registration papers. The vehicle identification number is on the wait rail in the engine compartment or on the base of the driver's seat. 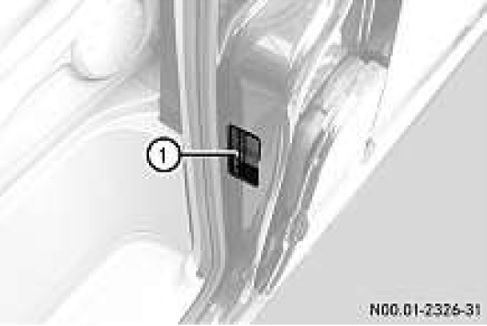 The vehicle identification plate, with information about the permissible weights, is located in the door frame of the driver's door ①. How will owners be contacted? Yes. There are no ‘Alpha’ airbags in any Mercedes-Benz vehicles and we are not aware of a ruptured inflator in any Mercedes-Benz vehicles worldwide. However, if and when you receive a letter asking you to have this recall performed by an authorised Mercedes-Benz retailer, please contact the retailer as soon as possible to book your vehicle in for the airbag to be replaced. 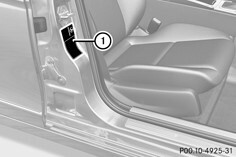 The inflator is a device contained within the airbag assembly. It contains propellant that is ignited in the event airbag deployment is necessary. When ignited, the propellant combusts and creates a gas that inflates the airbag. My SRS lamp is on now? An illuminated SRS lamp can be caused by numerous components or even low battery voltage. An authorised Mercedes-Benz retailer is best suited to diagnose and repair your vehicle as soon as possible if the SRS light is illuminated. Please contact your preferred authorised Mercedes-Benz retailer to discuss any specific vehicle concerns. Will my car be repaired with the same bad part? We are not doing a “like for like” replacement and instead are replacing the airbags with a superior solution that does not use ammonium nitrate. What is the likely wait time for a repair? The new airbags are currently in production. The affected airbags will be replaced in stages. If your vehicle has an affected airbag inflator, you will be contacted by letter when your vehicle is ready to be recalled. Why does it take so long to have the recall done once it is announced? Since this Takata recall affects multiple manufacturers and thousands of vehicles nationwide, the volume of replacement parts required is extraordinarily large, therefore Mercedes-Benz is releasing this recall in stages. Can I get a loan vehicle or alternate transportation until the parts are ready? Our authorised Mercedes-Benz retailers will book your vehicle in for repair at a mutually convenient time, and we do not expect that you will be without your vehicle for more than 24 hours. Subject to availability, if your authorised Mercedes-Benz retailer anticipates that you will be without your vehicle for more than 24 hours, then we will endeavour to provide you with a loan car or alternative transport. Where can I have the recall work completed? A letter will be mailed to each affected owner when parts are available. With the receipt of this letter, our customers will be asked to contact their local or preferred authorised Mercedes-Benz retailer to arrange for an appointment to complete the repair. Do I have to wait for a recall repair letter before I can have my vehicle fixed for this recall? Yes. We are in the process of obtaining the necessary parts to launch the recall. Once they are available, you will be sent a letter asking you to schedule an appointment with your authorised Mercedes-Benz retailer to perform the repair. When will parts be available? We are working closely with Daimler AG (DAG) and Takata to secure parts for the recall repair. DAG will progressively replace all identified affected Takata airbags with a superior technical solution. Do I need to drive differently until my vehicle is repaired? No. Continue to drive with your seatbelt fastened and all occupants properly seated. What is the expected impact or risks related to this issue? Should a safety defect be present, the airbag might not deploy as specified, increasing the risk of injury to occupants. Should the installed airbag inflator not deploy as specified, the airbag module might not fulfil its restraint function and there would be an increased risk of injury for the occupants due to separating inflator parts. We are not aware of any cases worldwide in which our models demonstrate the fault symptoms described by Takata in relation to a Takata airbag inflator. How long does this replacement take? The current estimate is about an hour (driver-side), and up to three hours for the passenger-side airbag, depending on the model. Why are other models not included? Other models are not included because this recall pertains specifically to vehicles equipped with the Takata PSDI-5 or SDI, and PSPI-2 and SPI inflators. What costs will be incurred by the customer? The airbag replacement will be conducted free of charge to customers. What if the vehicle is an imported Mercedes-Benz? Mercedes-Benz New Zealand only receives recall notification from the manufacturer regarding vehicles built for New Zealand. Owners of a vehicle which was not imported by Mercedes-Benz New Zealand will not receive a letter from Mercedes-Benz if a recall is issued on their vehicle. How do I check if the recall is outstanding on an imported Mercedes-Benz? Authorised Retailers can check the global system to see if a recall has been issued on the vehicle VIN number in the country of origin. What if the recall has been issued on my imported Mercedes-Benz? The vehicle can be booked in for repair at a mutually convenient time, and subject to parts availability. The airbag replacement will be conducted free of charge. What if the recall has not been issued, but I believe my imported vehicle may be affected? The system will only show recall information that has been released in the country of origin. We recommend customers make contact with their nearest authorised Mercedes-Benz Retailer every 6 months to check for any recalls that may have been released on their imported vehicle. Alternatively, customers can contact mbnz.safetyrecalls@daimler.com.